Christopher Saynt is the first openly gay wrestler in Scottish history. Dubbed Scotland’s sexiest sinner, Clydebank born Christopher began a career in wrestling in 2010. At this point and only age 17, Christopher had previously had an ambition to become a wrestling manager. Christopher trained at the Scottish Wrestling Alliance’s Source Wrestling School but has branched out since and wrestled for many different companies including Pride Wrestling. He has over 100 professional matches under his belt, was a previous Scottish Junior Heavyweight quarter finalist, and fought Mikey Whiplash in a Scottish title fight for Heavyweight Champion. After Christopher came out, he received negative responses and hate mail from many people. Christopher was quoted in the press as saying “I’ve had people send me emails saying we don’t want to pay money to see your shows. It’s a sign that prejudices still exist. When it comes down to it, wrestling is a bunch of men in their underwear cuddling angrily." With a 73% win rate in 2015, we can’t wait to see what 2016 has in store for Christopher, and are really glad this angry cuddler has decided to become an activist and work with LEAP Sports Scotland. 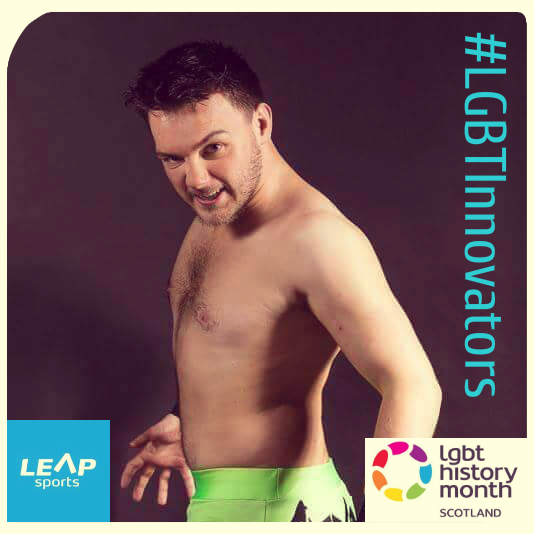 Leap Sports is spotlighting #LGBTInnovators in sport throughout LGBT History Month this February. We will celebrate a different LGBTI innovator in sport each day. LGBTI sports innovators include athletes, competitors, coaches, managers, community members, founders or co-ordinators of sports groups, someone passionate about their sport. Got an LGBTI innovator in sport that you would like to shine a light on? Use your imagination and join the conversation using the hashtag #LGBTInnovators on Twitter @Leapsports and Facebook facebook.com/leapsports. Find out more about LGBT History Month at www.lgbthistory.org.uk. Written on 25th February 2016.